Dates and times are tentative and subject to change. Junior League Holiday Market will feature a fabulous Preview Party shopping event. This premier event will allow all attendees to preview and purchase the market items. TIME: 7:30 p.m. to 10:30 p.m. FEATURES: A live band, cocktails, and hors d’oeuvres. OTHER: To request media passes, more media information or schedule an interview, please contact hmmedia@jltw.org. 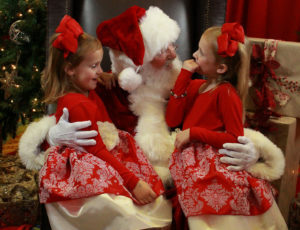 Junior League Holiday Market will feature photos with Santa. Children under 10 do not need a ticket to enter Market. SPECIAL EVENT PROCEEDS: All proceeds from the event support JLTW’s volunteer training and its programs, benefiting the communities of North Harris and South Montgomery Counties. MORE INFORMATION: Call 1-888-746-7455 or email office@jltw.org with any questions.